News Anchor: Thank you for joining us this evening. I'm Ann Core. We take you now to Times Square in New York City where our crime reporter Drag Nett is standing by. What have you got for us Drag? Drag: Thanks Ann. I''m here with a man dressed all in yellow, who actually looks like a banana. This man just single handedly foiled a bank hold up and turned the robbers over to police. What is your name, sir? Banana Man: Why, I'm the super hero Banana Man. Drag: Did you say Banana Man? What kind of a name is that? Banana Man: Well, my parents gave it to me. Drag: And who are your parents? Banana Man: Well, my Mom was Chiquita and my Dad was Monte, Del Monte. Drag: Do you have any brothers or sisters? Drag: Do you work on your own? Banana Man: Sometimes I'll work with my cousin Herb. Banana Man: Yeah, he needs the bread. Banana Man: Yeah it's not like they're mutually exclusive: banana, bread - duh. Drag: Is there anyone else we should know about? Is there a woman in your life? Banana Man: I've been known to date. Drag: I fig-ured as much. 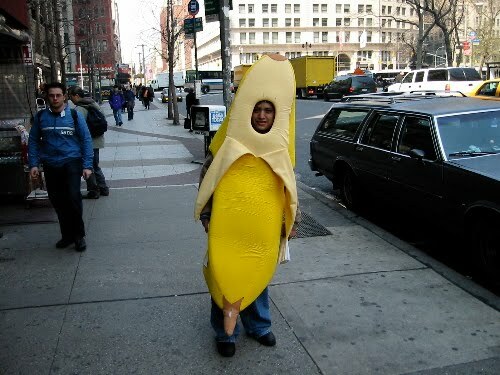 Banana Man: Yeah, my main squeeze is Betty Pulp. Drag: Oh and what does she do? Banana Man: She's a peeler. Banana Man: She prefers the term exotic dancer. Drag: I see. So tell me, how did you become a super hero? Banana Man: Well I got my training at the Fruit of the Loom boot camp. Banana Man: Yeah, you see there's a whole um, ah, basket of us fruit. Those guys doing underwear commercials are actually rejects. Drag: The purple and green grapes, the apple and the gooseberries? Banana Man: Yeah, those guys failed miserably at boot camp. They were simply the pits. Not that they weren't nice fruit. For example Mr. Apple was a swell guy right to the very core. Drag: I see. But you. You succeeded? Banana Man: Yeah, me and my banana buddies. But once we'd been picked for super herodom we bananas split. Banana Man: Yep, after all we were ripe for action. Drag: Where was this boot camp? Banana Man: At an undisclosed location. In Banana Republic. Drag: Let me guess: a place where bananas could have an outlet for their aggressions? Banana Man: You got it. Drag: And were all the recruits successful? Banana Man: No, I'm afraid some were yellow, just too frightened to be a super hero. Drag: Why did you want to be a crime fighting super hero? Banana Man: Oh I've wanted to be one ever since I was little. My interest stems from that. Drag: And now you're a successful super hero. Banana Man: Hey, I produce results! Drag: So tell me, how many Banana Men are there out there? Are there lots of you guys fighting crime. Banana: Heck, no. You think we grow on trees or something? Don: I actually got the idea from a news story I saw about a guy who was arrested after dressing as a banana, brandishing a rifle, riding around with a "bunch" of his friends. Glad you enjoyed it, Don. I'll give you a hand for this post. 00dozo: I'm not sure I know what that means but thanks a bunch. I can't believe you slipped your way thruough that. Really peeled back all the layers of the superhero. Does that stem from a past experience or a just a bunch of fruity bs. Great stuff. dufus: A bunch of bananas is also known as a "hand". What did you think it meant? Frank: Touché. Well done. And welcome. Glad you found me through Studio30+. That's a great place. 00dozo: Well I looked up "hand banana" on Urban Dictionary and I knew you were too polite to mean THAT. You learn something everyday. Oh, my! That's disgusting! I don't mind (and I didn't mean)the phallic reference, but that other thing?!? Eeek! 00dozo: Yeah that wasn't very, urm, ah, appealing. Ziva: Heh, heh - glad you enjoyed it. I had fun putting it together. Whether you laughed or groaned doesn't matter. Either way my work here is done. Good job Nomesters! Good job. Quirks: Hey quit monkeying around. Go have that banana split. Mike: Hey don't knock bananas. Don't tell me, you were born in Xanth, weren't you? I hope this guy doesn't slip up and end up in a fruit salad because he confronted the wrong bad guys. Tarheel: Hey there Tribal Blogs buddy. Ha, ha no not Xanth. If he ended up in a fruit salad, that'd be one juicy story. Thanks for dropping in. Hope to see you again. CL: That's not Banana Man, that's Carrot Top's father! You know I watched Captain Kangaroo as a kid and just can't remember ever seeing Banana Man. I guess my memory is slipping. I enjoyed this post very much....... I was reading it in my hammock.... make that my banana hammock. Oh my. This is a blast from the past but it's always a-peeled to me. I'm glad you enjoyed it.